Opt for Courier Delivery this Valentine’s Day! We know it’s hard to plan surprises. Don’t worry, opt for Courier Delivery this Valentine’s Day and we will do the rest! 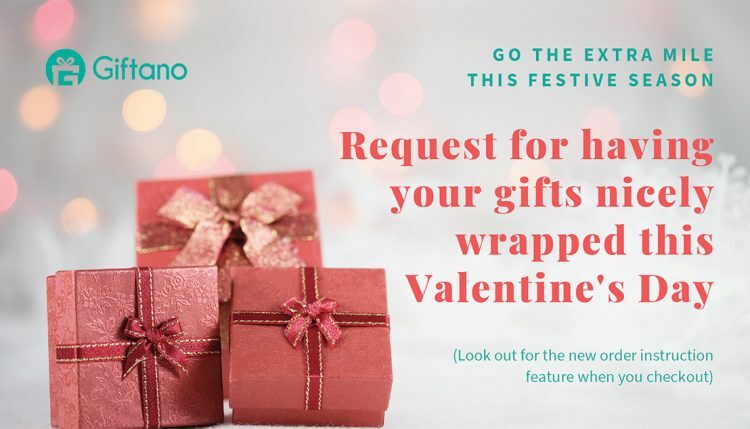 Here at Giftano, we strive to make your gifting duties easier. Just visit Giftano.com, or simply click on the links below. Browse and choose gifts from any of our awesome partners and create your own personalised greeting card within seconds. Next, select Gift Box by Courier Delivery. Don’t forget to add in details under the new order instruction on the check out page! You can request for the gift box to be wrapped nicely and include the time and date for the gift to be delivered to your special person. Lastly, make payment through our secured system and we’ll take care of the rest! Surprise gift giving has never been so easy. *To avoid having delays in your delivery, make sure to send in your orders by Wednesday, 13 February. Browse through the lists below, curated just for you. Treat your beloved significant other to a romantic dinner this upcoming special day! Surprise them with gift vouchers from our partners like Long Chim and OSO Ristorante. If you think a romantic dinner is too cliché for the upcoming Valentine’s, check out our list of best experiences such as a dinner for two on a Tall Ship Yacht, and many more! We are always happy to hear from you. If you have any queries, do not hesitate to contact us at [email protected]. Alternatively, you may browse through our FAQs here.